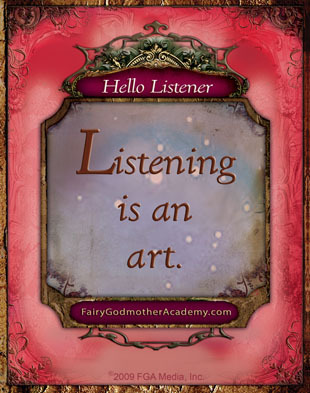 Hello Listener!Listening is an art. Hello Academy Founder! Have you heard the song Hello Dreamer yet? Paying attention and really listening is an art, and it is an art that pays off in this quick little quiz. 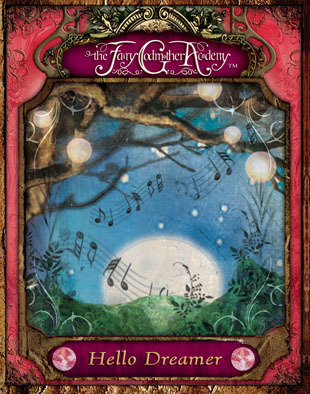 Answer 7 questions correctly to earn a FREE MP3 download of the Hello Dreamer Remix from the Fairy Godmother Academy shop! What kind of ladder do dreamers climb? Where should you leave your old shoes? What color threads do dreamers weave? What do dreamers cook up? What color is the Hello Dreamer bird? The Dreamer’s sky is made of what? Who could be beyond the blue door? If you believe in what you’re feeling, what should you do? What is the Million Girl Choir’s Wisdom? My voice is in the dream world. I sing a song of sixpence. My voice protects the green world.